A group of young ladies have climbed "under the bank" on their trip to the Lower Falls - quite a feat given the clothing they have on. 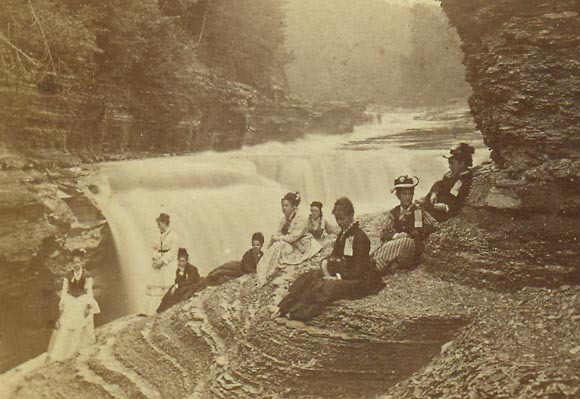 Behind them the Genesee River drops over the main falls into the "Flume" . Although the Flume can still be seen, some of the bank where they are sitting was removed in the 1930's for a trail and the bridge. See Image 61 for another view of visitors at the Flume and a modern photograph of the area. And live our bright Portage days over again. His generous kindness to "74"
Their names were Mary Mendenhall, Minnie Porr, Carolyn Ladd, Mary Allen, Abbie Fordyce, Bessie Love, Anna Letchworth , Marianne Ladd and Elizabeth Conkey. Howland Academy was a "prep school" for young ladies founded by Robert Howland, a wealth Quaker merchant and friend of the Letchworth family. In 1863 he purchased a large home to be a Young Ladies Institute, later named Howland College to honor its benefactor. The school could house 100 borders and had a 'full collegiate curriculum' ". This group can also be seen in images 33, 70, and 172. Thanks to our friend Leonora Brown for her help!